The data logger will measure in a continuous streaming mode, until it is stopped by the user. While measuring, each time new samples are taken, they will be transferred directly to the computer where they will be processed and displayed and when required stored to disk. Any change in the input signal(s) will be immediately visible. The measurement duration is not limited by the amount of internal memory in the instrument, allowing for very long uninterrupted measurements. The main difference with the oscilloscope is that the oscilloscope measures a predefined amount of time and stores all measured data internally in the instrument. When all data is measured, all data will be transferred to the computer and then be processed and displayed. After that, a new measurement will be started. This limits the total measuring length to the the size of the available memory inside the instrument. And there will always be a gap between two successive measurements. The measuring mode of the data logger / transient recorder makes it the ideal instrument for measuring slowly changing signals like e.g. the temperature change in a room. While capturing the whole process, any change on the input signal(s) is immediately visible. The data logger / transient recorder can have one or more graphs, each displaying one or more signals, where each graph can display different parts of a signal. 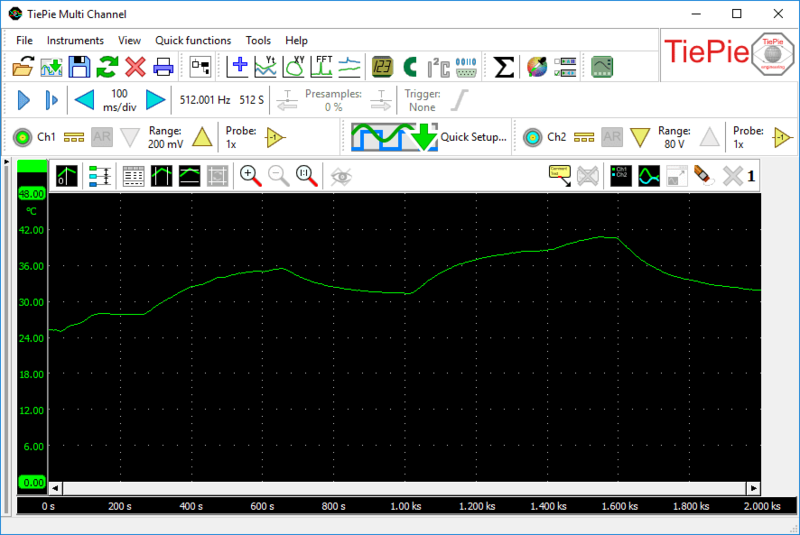 Graphs can display the signal(s) in Yt mode or in XY mode, with or without interpolation. Colors of all items in a graph can be set to any required value. Graph dimensions can be adjusted to any required size, graphs can be located in one single window or in separate windows, which can be located anywhere on the desktop. Cursors are available to make on screen measurements. Signals can be given descriptive names and a legend is available to simplify identifying the displayed signals. Text labels can be placed to mark interesting parts of the signal(s). Measurements are only limited by the available memory in the computer or the available disk space. To reveal all details of the measured signals, unlimited zooming is available in both vertical and horizontal direction. All zoom actions can be undone with an undo zoom function. Controlling the data logger / transient recorder is done through customizable toolbars, through popup menus and by hotkeys. A quick function toolbar is available for often used functions.